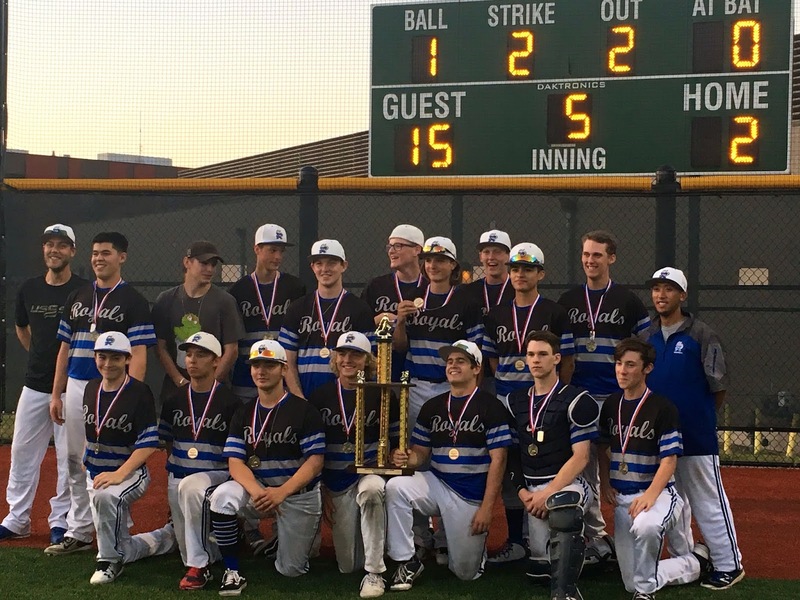 The 16u Shoreline Royals baseball team won their Mickey Mantle State Championship playoffs on Monday, July 16th at Shorecrest High School against the Legends Baseball Club from Monroe. The playoffs were hosted by Washington Elite Baseball. The playoff structure was a double elimination tournament, like the College World Series where a team must lose twice to be eliminated from the playoffs. To advance to the championship day, the Royals had to win at least three of their first four games over the weekend. The Royals gave up early leads in the first three of the four games but ended up sweeping the competition and compiling a perfect record to the championship round. In fact, the Royals, at one point of each game, trailed as much as 10 runs in game one, 5 runs in game two, and game four by 6 runs but rallied back each time to take the lead and held on for the wins. Going into the championship game, the Royals were the only team left with a perfect 4-0 record and therefore had to be beaten twice by the Legends to lose the playoffs. In true fashion, the Royals again trailed the game by 5 runs but came back and took the lead in extra innings (8) only to lose off a walk-off of a final score of 8-9. It seemed to work, as the Royals went on and put a pounding on the Legends the second game. Gannon Dow was the losing pitcher of the first game but immediately came back to start the second game mentally refocused. He went 3 innings, gave up only 2 hits, recorded 6 strike outs, 1 walk and no runs. Ben Lockwood came in relief for Dow and sealed the deal for the Royals, beating the Legends in a mercy-rule shortened 5 innings of a final score of 15-2. The Shoreline Royals are hosting their free tryouts for their 2019 teams next season at the end of the month. Sign up here.